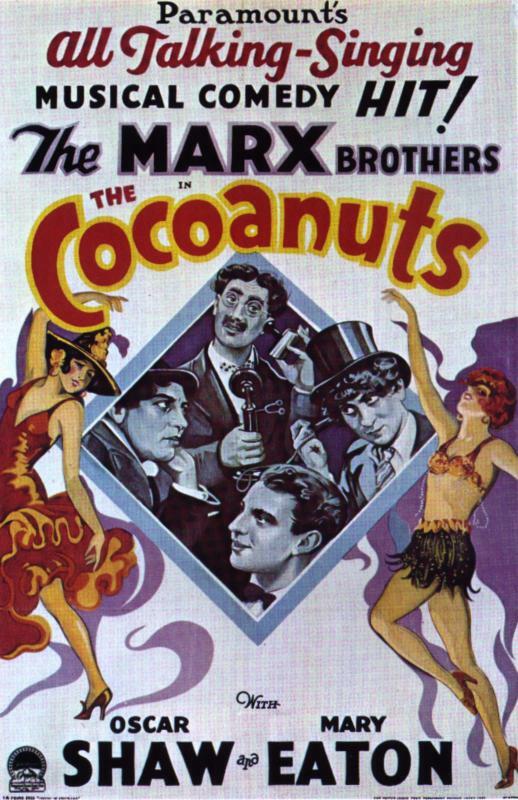 This was the Marx Brothers' first movie (if you don't count "Humor Risk") and was one of the earliest sound films ever made (pay attention to scenes where Groucho is showing maps of Florida real estate, and you will notice the maps are soaking wet to avoid overdriving the recording equipment). Groucho plays Mr. Hammer, a Florida hotel owner during the Florida land boom in the 1920's, desperately trying to unload real estate on unsuspecting buyers. Zeppo is the desk clerk (Jamison), Chico is an "idle roomer" and Harpo is his "silent partner." Hammer takes on Chico as his shill to try to up the price of his questionable real estate (prompting the famous Why A Duck? scene), and various guests try to swindle one another for various reasons. This film also features music written by Irving Berlin, though not his best material by a long shot. The insipid love song, "When My Dream Comes True," drones on relentlessly through the entire film, and how many of you remember "The Monkey Doodle Doo?" An interesting side note regarding the forgettable music in The Cocoanuts: For years, Groucho teased Irving Berlin about not having been able to give them even one hit song for the show. In his defense, Irving Berlin replied that he had taken a song to Sam Harris and played it for him. Harris listened carefully and said the song would never be a hit. That song was "Always," one of Berlin's biggest hit songs. HAMMER: You - you know what an auction is, eh? CHICO: I come from Italy on the Atlantic-Auction.